These small lamb pies are perfect winter food. Fairly quick and easy to make as well as tasty and filling. There's not much more you can ask for. As always, freestyle this to suit you and your taste. Add and subtract ingredients to match what you got at home. I think that this dish has a bit of a North African twist to it with the harissa and apricots. Marinade the lamb in the harissa paste over night. Heat some oil in a frying pan and fry the lamb until browned on all sides. Remove from the pan and put to the side. Cook the onion and carrot in the pan until they start to soften. Return the lamb to the pan and stir in the tomatoes, oregano and apricots. Stir well and bring to a simmer. Divide the mixture between two 400ml ramekins (or similar). Cover the ramekins with the puff pastry and cut a cross in the middle with a sharp knife. 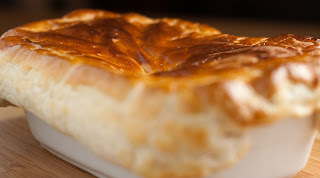 Brush the puff pastry with the beaten egg. Cook in the oven for about 20 minutes or until the lid is nice and golden. Made them, i was speechless just... Delicious!!!! I'm so glad that you liked the recipe enough to try it. Jag går och funderar på att laga pork pie. Det här låter verkligen gott! Kanske mjukstarta med en variant på denna, fast med fläskfärs och bacon? Jag fick tanka till lite dar. Jag ar sa van att tanka pa stora 'klumpar' av kott i pajer som det har. Men, jo - det skulle nog kunna funka valdigt bra. Jag skulle nog forsoka att fa en lite torrare sas an vanligt men annars ar det bara att kora pa.
Lat mig veta hur det smakade? Makes me hungry just looking at the picture!! I love these, had a go at them and the whole family enjoyed them! Just browsing and came across this website. Interesting read and most informative. Will be back for updates. Thanks.